Can the Navy Build Bases at Sea? Even as its mission expands to include a wide range of operations outside of the scope of traditional naval warfare, the U.S. Navy has realized that it can no longer count on land bases in friendly countries to accomplish the tasks assigned to it. A superb example is the challenges the USN faced in delivering sustained humanitarian relief in the face of the utter devastation of the Haiti earthquake. For that reason, the Navy has developed a concept it calls “Sea Basing,” an operational capability designed to enable the Navy, Marine Corps, Coast Guard, and non-military agencies to carry out a range of military, diplomatic, and humanitarian operations far from American shores without having to worry about friendly ports and airports nearby. Doing so, however, is not simply a matter of sending a few more cargo ships or helicopter carriers out to sea: it will require an entirely new set of capabilities for a Navy used to using shore facilities when deployed far from home. 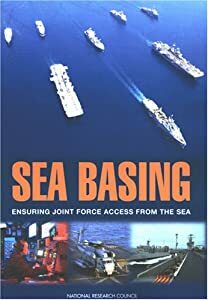 Sea Basing: Ensuring Joint Force Access from the Sea is the report of the National Research Council on what technologies and capabilities the Navy will need to implement this concept in the coming years, from air and sea platforms that will be needed to the systems and doctrine necessary to make them work. This entry was posted in Logistics, National Security. Bookmark the permalink. ← Is the 1,000 Ship Navy Workable?